A circular disc, cut away at the centre to leave only a T-shaped strut, has a handle and 23 triangular teeth cut from the same piece of metal as the disc, the 24th tooth being engraved on the handle. The teeth are numbered counter clockwise 0 / 12 to 12, a radial line descending from the point of each tooth towards the centre of the instrument to divide two concentric month scales which are numbered around each division line and read clockwise. Starting from January 1, which is set below tooth number 3 (to the left of the handle), the two scales run 'IA 1' / 'F 21', 'IA 14' / 'M 9', 'IA 29' / 'M 26', 'FB 14' / 'A 11', 'MA 2' / 'A 27', 'MA 18' / 'M 12', 'AV 5' / 'M 27', 'AV 20' / 'I 11', 'MA 6' / 'I 26', 'MA 21' / 'I 10', 'IV 4' / 'I 25', 'IV 19' / 'A 10', 'IVL 4' / 'A 26', 'IVL 18' / 'S 12', 'AV 4' / 'S 28', 'AV 20' / 'O 14', 'SE 5' / 'O 29', 'SE 21' / 'N 13', 'OC 8' / 'N 27', 'OC 23' / 'D 10', 'NO 7' / 'D 24', 'NO 22' / 'I 7', 'DE 6' / 'I 21', 'DE 18' / 'F 5'. At the centre of the disc the 12,3 and 9 teeth lines are extended downwards to the point of further teeth left standing on the inner circumference although the purpose of this may be purely decorative. 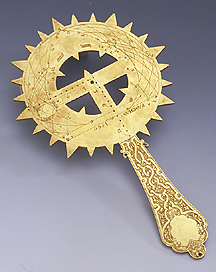 On the reverse side the instrument is engraved with hour diagrams for Italian and Bohemian hours, crossed by arcs for the signs of the zodiac, drawn for latitudes 42? and 49?. The vertical and left hand members of the central strut carry a shadow square the numbered divisions of which are radial from the twelve division on the opposite portion and the individual points are indicated by small holes drilled through the plate. At the centre of the instrument is a sighting hole, and below the hour diagram is the inscription noted above. The handle of the instrument is engraved on both sides with finely executed symmetrical strapwork decoration in light relief around flowers and leaves executed against a hatched ground. On the hour diagram side an escutcheon has been prepared for a coat of arms but left blank at the top of the handle.